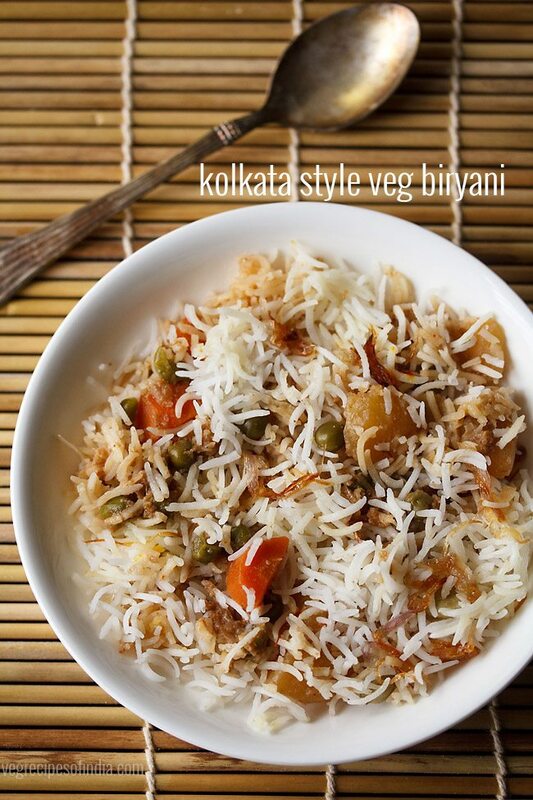 kolkata style veg biryani recipe - a light and flavourful version of biryani from the bengali cuisine. kolkata style veg biryani recipe with step by step photos – a light and flavourful version of biryani from the bengali cuisine. i prepare this biryani on occasions and so i thought of sharing the recipe too. 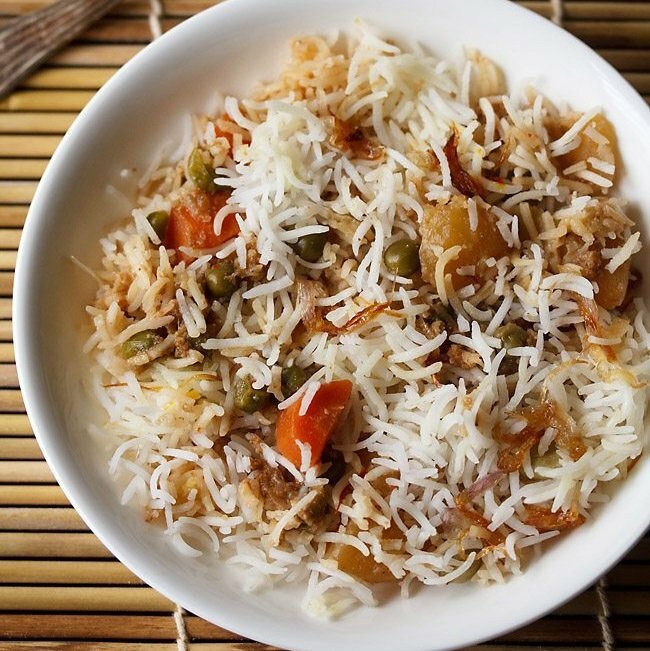 initially when i had made for the first time a couple of years back, i had adapted the recipe from some cook books, but later on i did make some more changes and the result is a very good biryani recipe. this veg biryani uses ground biryani masala powder. initially i would prepare freshly ground biryani masala powder while making the recipe. but this time since i had homemade biryani masala powder, i have used it. but if you do not have biryani masala, then i have mentioned the spices used for freshly ground biryani masala in both the recipe card and step by step pics below. kolkata biryani is derived from the lucknowi biryani and different from the hyderabadi veg dum biryani or south indian versions of biryanis. this version is mildly spiced and light. 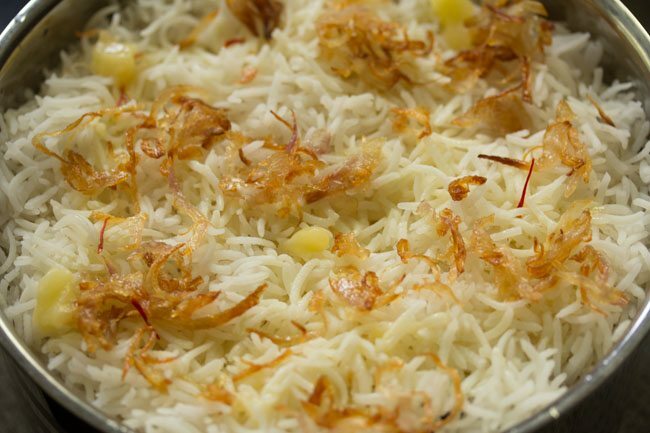 i prepare this biryani recipe both with ghee and mustard oil on different occasions. of course ghee gives a nice light subtle flavor. with mustard oil the flavors become robust. the punch and flavor of the mustard oil is felt without subduing the other subtle flavors of the spices and the other ingredients. talk about balance and it is there in this dish. 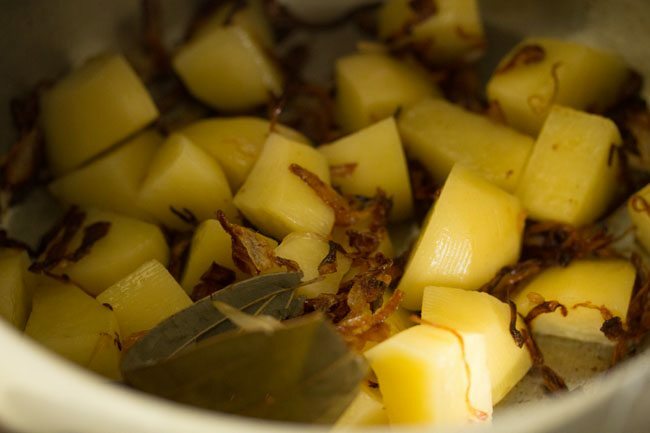 the best part is that the potatoes soak the flavors of the mustard oil too well and taste great. since we do like mustard oil, on occasions i make the biryani with mustard oil. so in conclusion, i would say, if you like mustard oil, then use it. if you prefer ghee over mustard oil, then use ghee. if using mustard oil, then do top some ghee on the rice while layering. in the recipe you can also add some dried plums if you have them. usually potatoes are fried in oil or ghee, but i have just sautéed them for some minutes while preparing the gravy. 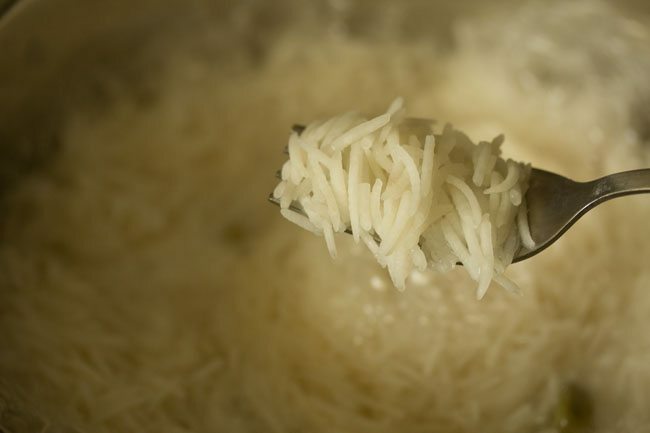 rinse 1.5 cups basmati rice till the grains runs clear of starch. 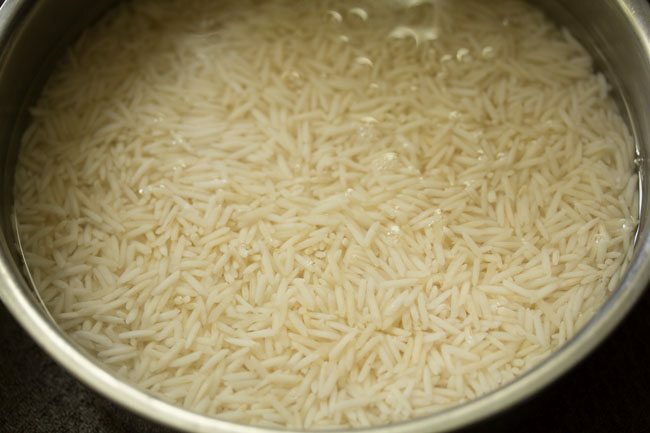 then soak basmati rice for 30 mins. later drain the rice. 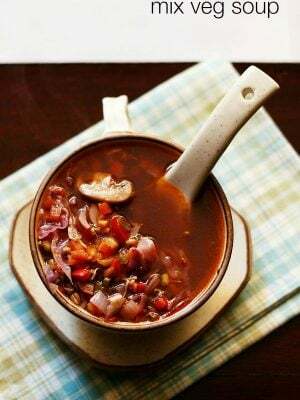 boil 5 cups water on a medium to high flame with 2 green cardamoms, 1 inch cinnamon, 2 to 3 cloves, ½ tsp caraway seeds, ½ tsp ghee (optional) and ½ salt or add as required. check the taste of the water and it should feel slightly salty. simmer on a medium to high flame without a lid till the rice is ¾th done. 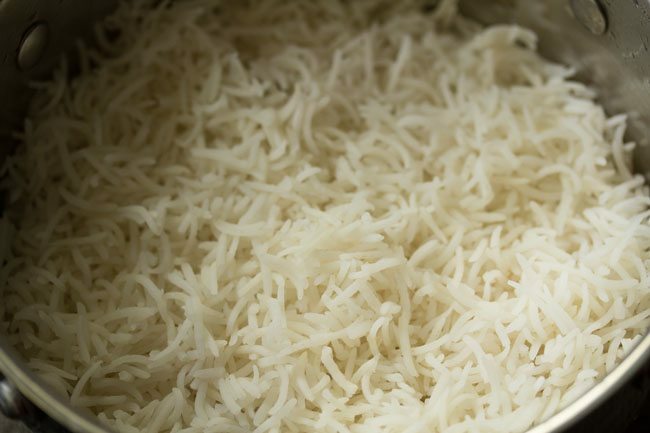 the rice grains should have a bite in the centre and must not be cooked fully. strain the rice and keep aside. let the steam pass and then cover and keep aside. in a bowl or measuring cup, whisk ½ cup yogurt till smooth. keep aside. 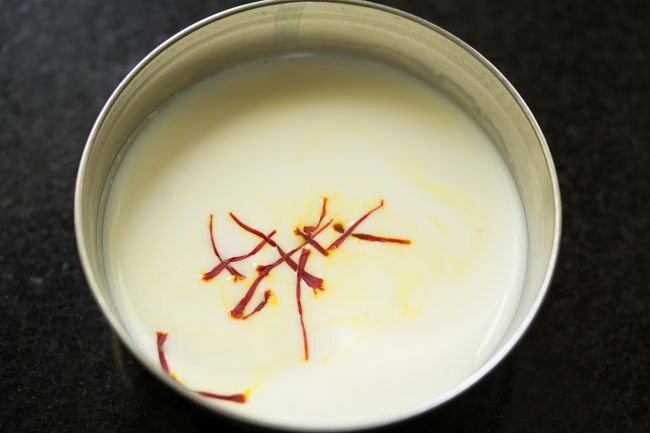 in another bowl, take ¼ cup warm milk or water and add 10 to 12 saffron strands in it. then add 1 teaspoon rose water and 1 teaspoon kewra water. mix very well and keep aside. if using biryani ittar or biryani essence, then just add 1 to 2 drops of it. thinly slice the onions. chop all the veggies and keep aside. 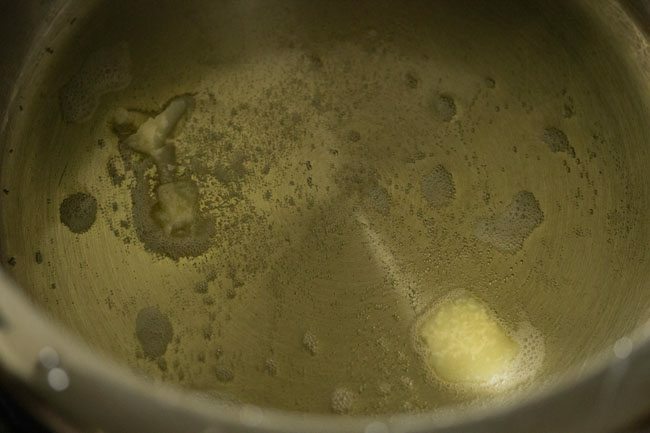 in a pressure cooker heat 3 tablespoons ghee. when the ghee becomes hot, lower the flame. add 1 tej pasta and stir. then add 1 cup thinly sliced onions. saute the onions on a low to medium flame stirring often till they turn golden. 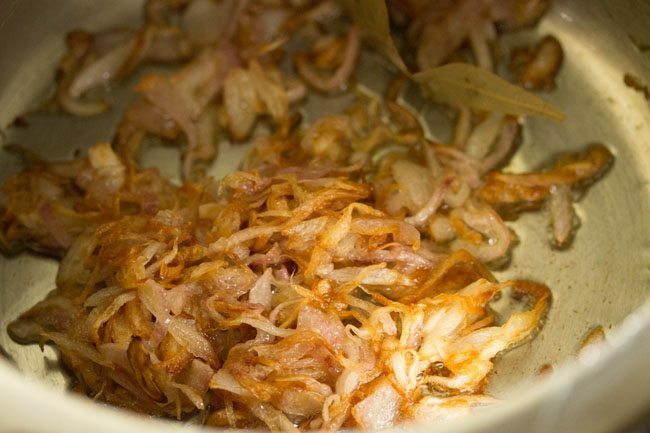 quickly remove half of the fried onions and keep aside. then add 1.5 to 1.75 cups chopped potatoes. saute potatoes on a low to medium-low flame for 2 to 3 minutes on a low flame. 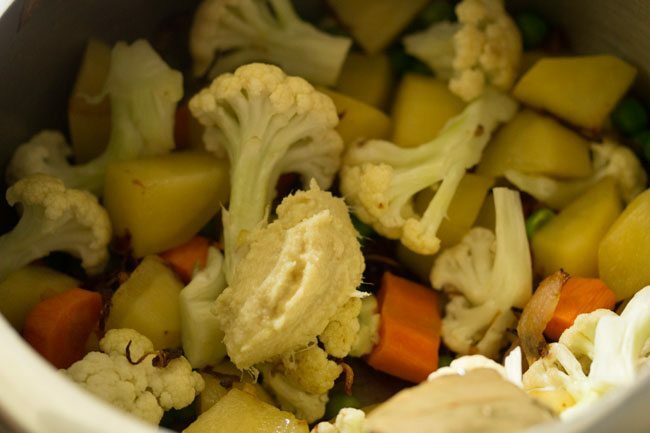 then add ½ cup chopped carrots, ½ cup green peas and 1.5 cups chopped cauliflower florets. add 2 teaspoons ginger-garlic paste. mix everything very well and saute for a minute. then add ½ teaspoon red chili powder and 2 teaspoons biryani masala. i have used homemade biryani masala. if you do not have biryani masala, then powder the following spices in a small grinder or a coffee grinder till fine - 2 green cardamoms + 1 inch cinnamon + a single strand of mace + 1 black cardamom + ½ tsp caraway seeds + 4 to 5 black peppercorns + 1 all spice/kababchini- all powdered finely. 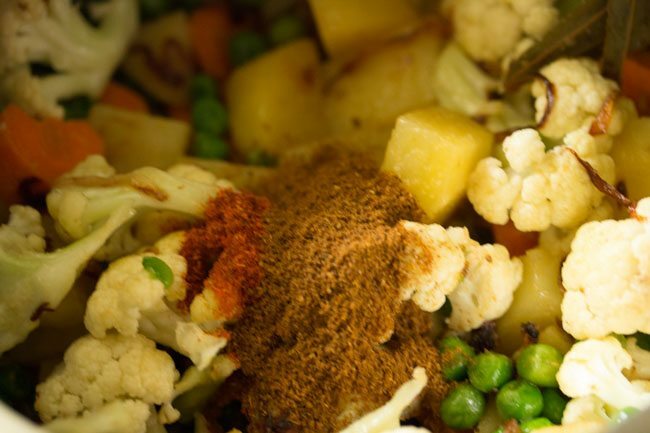 mix the biryani masala very well with the veggies. then add the beaten curd. mix again. season with salt as per taste. stir very well and pressure cook for 8 to 9 minutes or about 2 whistles. 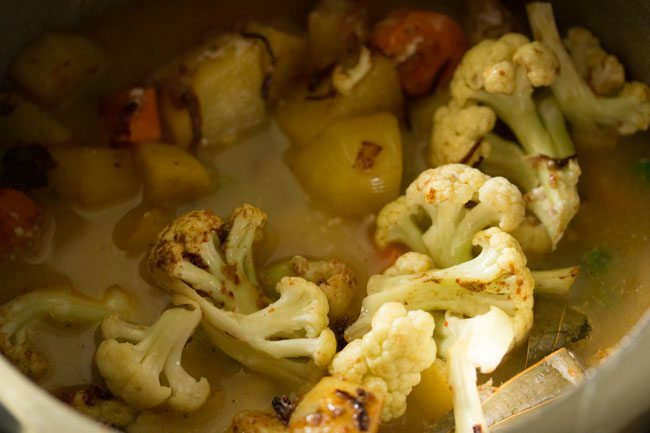 you can also cook the gravy in a pan and then cover and simmer the veggies till they are cooked. 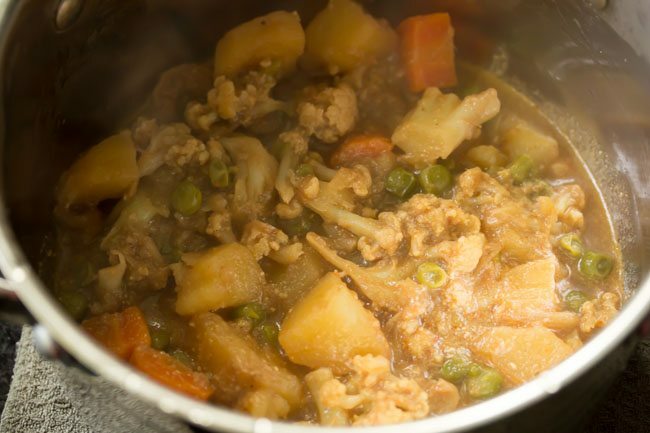 if the curry looks dry, then add some water and if its too thin, then cook for some time. now take half a portion of the gravy in a thick bottomed pan or if you want you can layer in the cooker itself. top with half of the fried onions all over. then sprinkle with half of the saffron + kewra water + rose water + milk mixture. layer with the remaining of the mix veg gravy. then layer with the remaining rice. 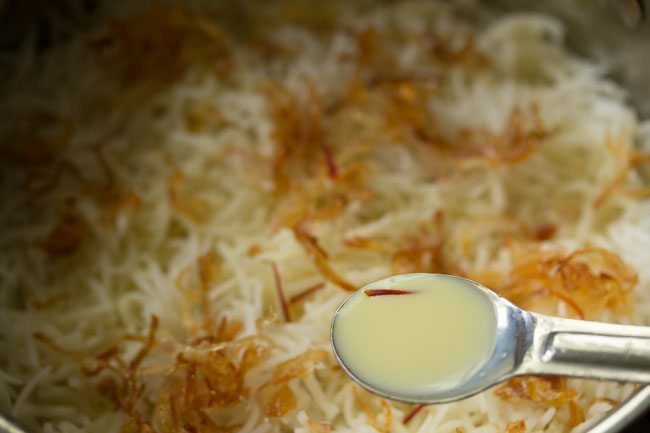 repeat layering with fried onions, saffron milk and dotting with ghee. tightly seal the pan with an aluminium foil. cover the pan with its lid. place the pan on a tawa or griddle. keep the flame to a low and dum cook kolkata biryani for 30 to 35 minutes. 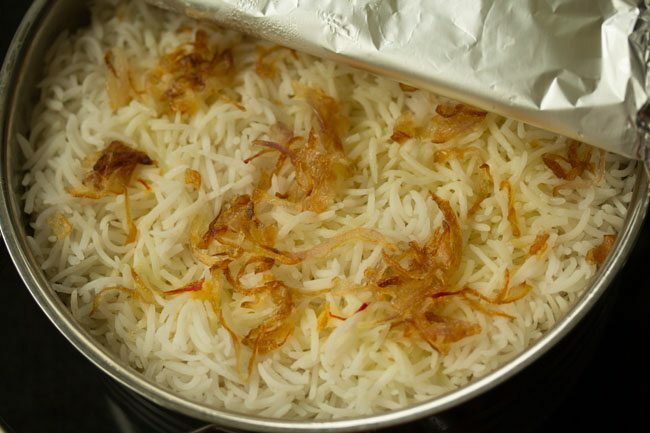 if baking kolkata biryani, then preheat oven at 180 degrees celsius for 10 minutes. bake for 30-35 minutes at 180 degrees celsius. once done, switch off the flame. 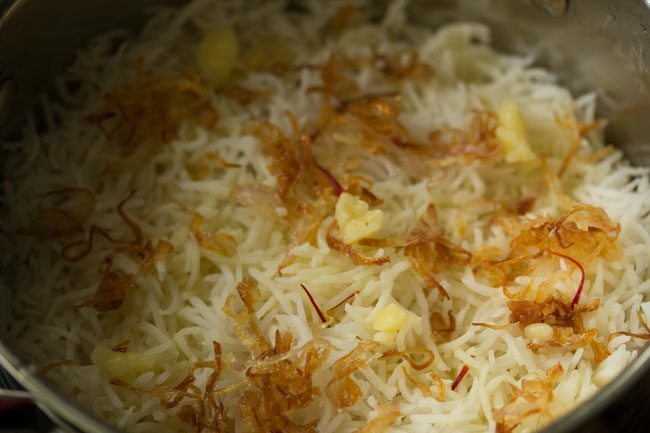 let the kolkata biryani rest for 5 to 7 minutes at room temperature before serving. then open the lid and the foil. if you see some gravy at the bottom, then dum cook the kolkata biryani for some more minutes. 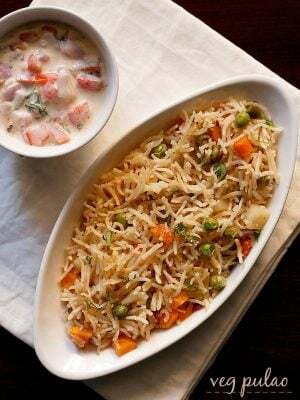 serve kolkata style vegetable biryani with raita and pyaaz ka lachcha. you can add your choice of veggies. skip kewra water if you do not have it. instead just add 2 teaspoons rose water. you can also add some dried rose petals instead of rose water. if you do not have biryani masala powder, then powder the following spices in a small grinder or a coffee grinder till fine - 2 green cardamoms + 1 inch cinnamon + a strand of mace + 1 black cardamom + ½ tsp caraway seeds + 4 to 5 black peppercorns + 1 all spice/kababchini - powdered finely in a dry grinder. skip all spice if you do not have it. 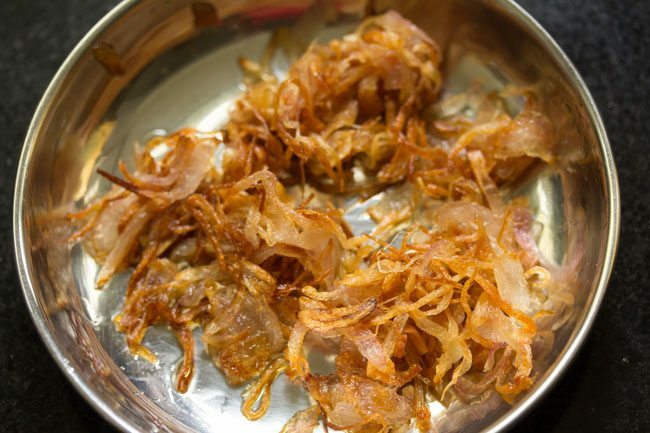 if using mustard oil, then heat it till it begins to smoke and then add tej pasta and onions together. you can use dried plums if you have them. 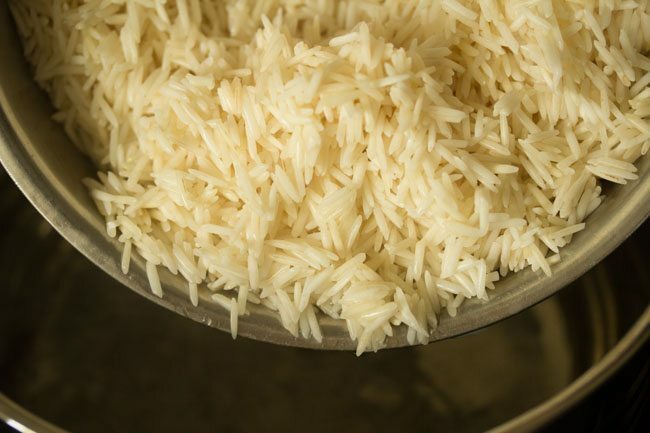 1. rinse 1.5 cups basmati rice till the grains runs clear of starch. 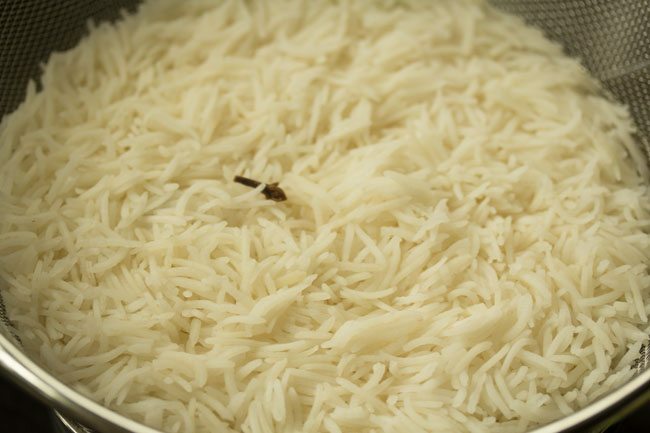 then soak basmati rice for 30 minutes. later drain the rice. 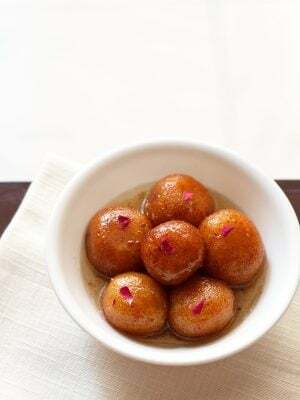 2. boil 5 cups water on a medium to high flame with 2 green cardamoms, 1 inch cinnamon, 2 to 3 cloves, ½ teaspoon caraway seeds (shahjeera), ½ teaspoon ghee (optional) and ½ teaspoon salt or add as required. 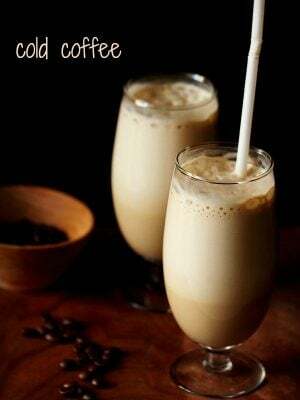 check the taste of the water and it should feel slightly salty. 3. then add the rice. 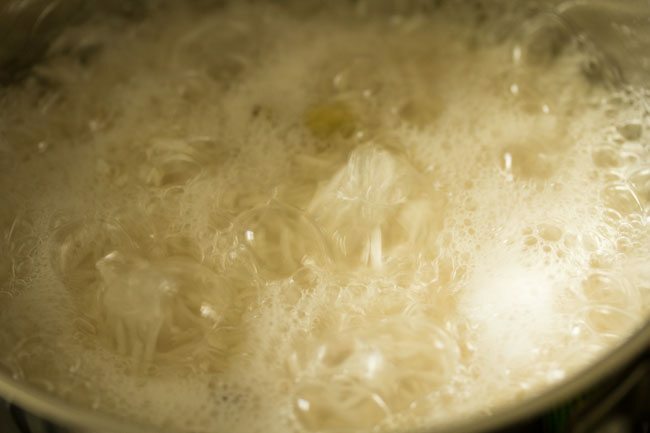 4. simmer on a medium to high flame without a lid till the rice is ¾th done. 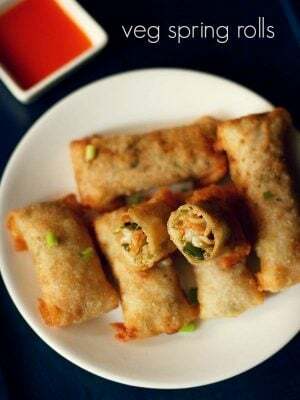 5. the rice grains should have a bite in the centre and must not be cooked fully. 6. strain the rice and keep aside. let the steam pass and then cover and keep aside. 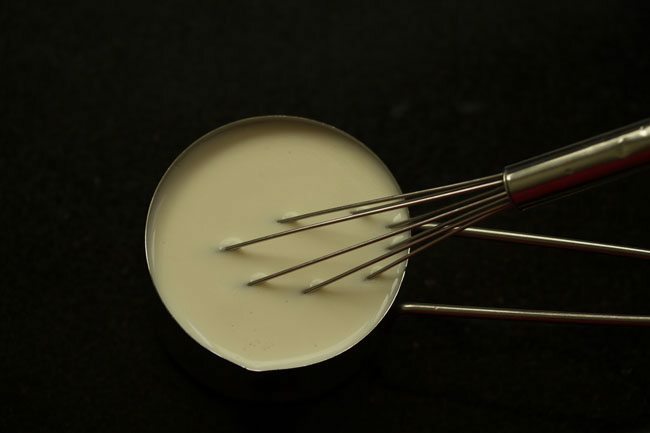 7. in a bowl or measuring cup, whisk ½ cup fresh yogurt till smooth. keep aside. 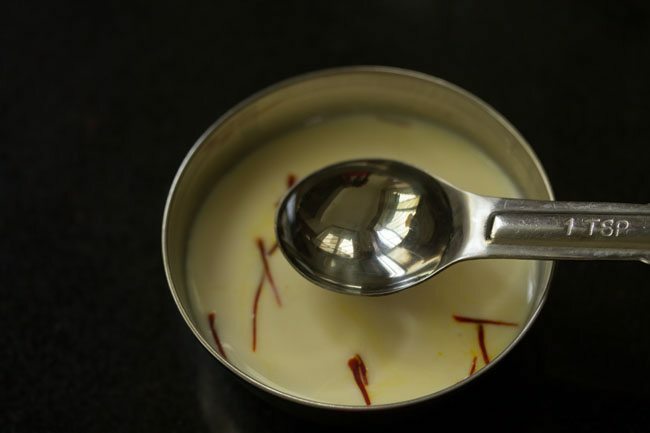 8. in another bowl, take ¼ cup warm milk or water and add 10 to 12 saffron strands in it. 9. then add 1 teaspoon rose water and 1 teaspoon kewra water. mix very well and keep aside. if using biryani ittar or biryani essence, then just add 1 to 2 drops of it. also slice onions thinly and chop the veggies. 10. in a pressure cooker heat 3 tablespoons ghee. if using mustard oil, then heat the mustard oil, till it starts to smoke. then add the tej patta and onions together (step 11 and 12). 11. when the ghee becomes hot, lower the flame. 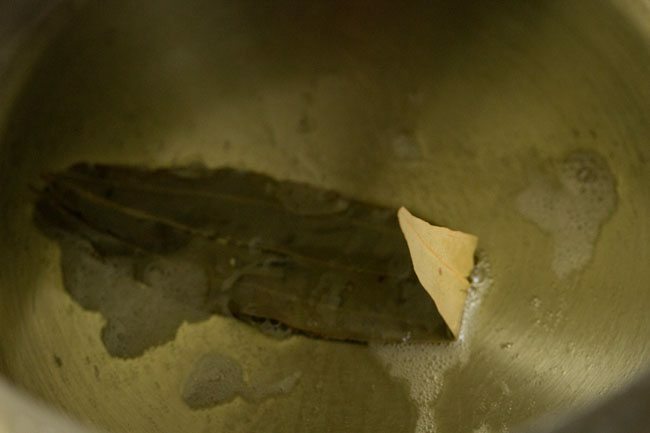 add 1 tej patta (indian bay leaf). 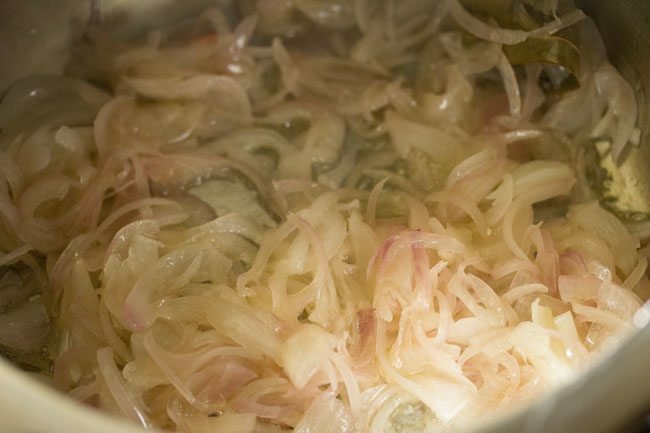 12. then add 1 cup thinly sliced onions. 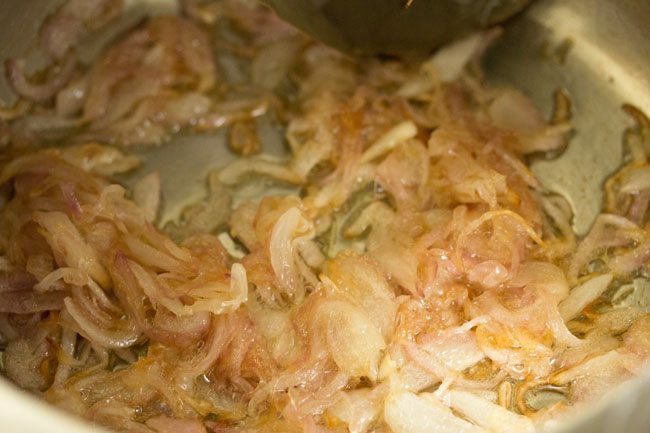 13. begin to saute the onions on a low to medium flame stirring often. 14. onions take some time too cook. so add a pinch of salt to quicken the process of cooking onions. 15. first the onions will turn light brown. 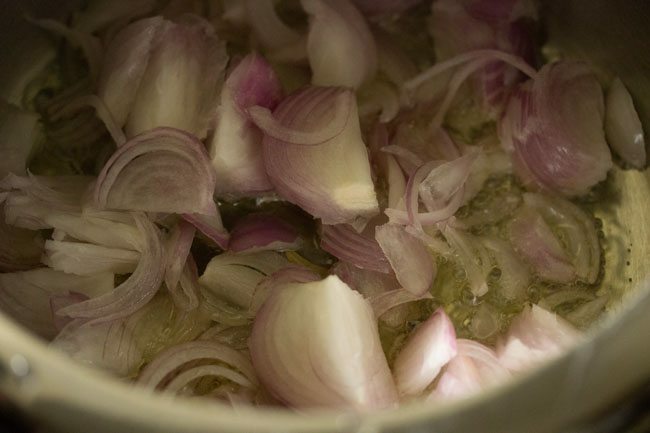 16. continue to stir often and saute till the onions turn golden. 17. quickly remove half of the onions and keep aside. 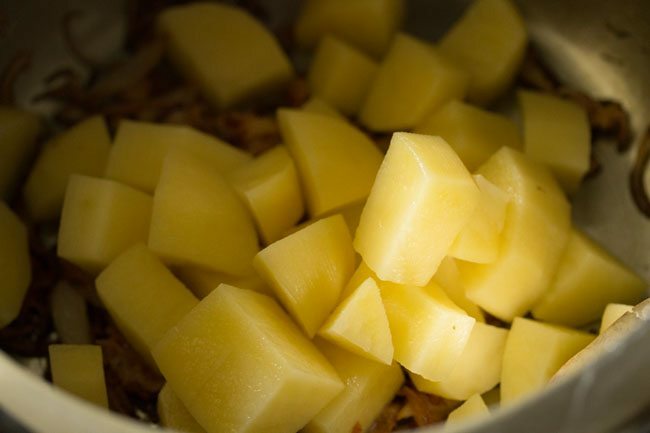 18. then add 1.5 to 1.75 cups chopped potatoes. 19. saute potatoes on a low to medium-low flame for 2 to 3 minutes stirring often. 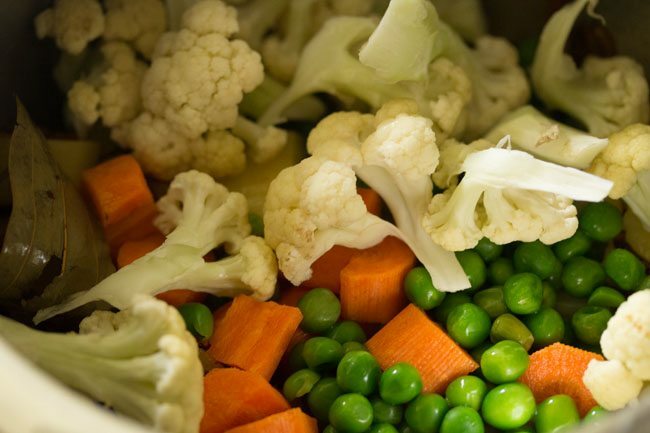 20. then add ½ cup chopped carrots, ½ cup green peas and 1.5 cups chopped cauliflower florets. 21. add 2 teaspoons ginger-garlic paste. mix everything very well and saute for a minute. 22. then add ½ teaspoon red chili powder and 2 teaspoons biryani masala. i have used homemade biryani masala. if you do not have biryani masala, then powder the following spices in a small grinder or a coffee grinder till fine – 2 green cardamoms + 1 inch cinnamon + a strand of mace + 1 black cardamom + ½ tsp caraway seeds + 4 to 5 black peppercorns + 1 all spice/kababchini – powdered finely in a dry grinder. skip all spice if you do not have it. 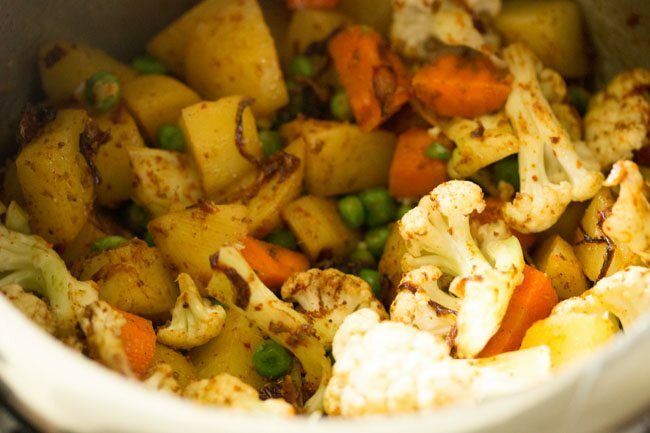 23. mix the biryani masala very well with the veggies. 24. keep the flame to a low and then add the beaten curd. stir briskly. 25. add ⅔ cup water. 26. season with salt as per taste. 27. stir very well and pressure cook for 8 to 9 minutes or about 2 whistles. 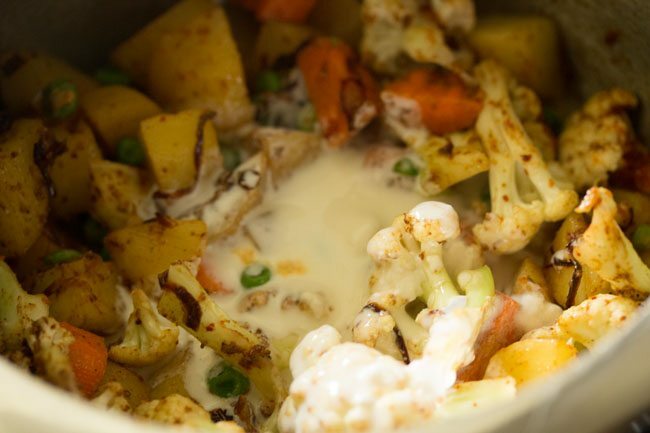 you can also cook the gravy in a pan and then cover and simmer the veggies till they are cooked. 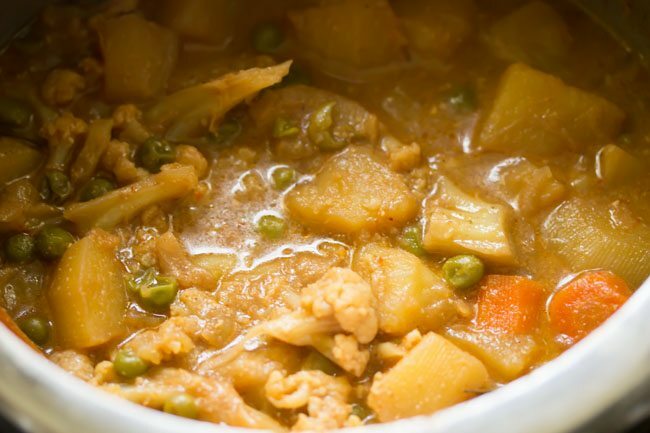 if the curry looks dry, then add some water and if its too thin, then cook for some time. 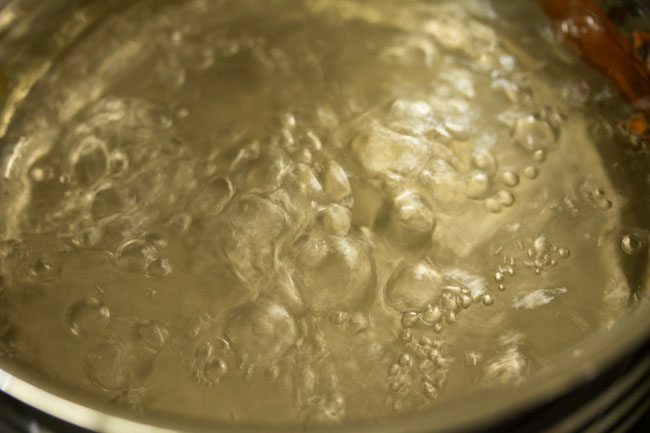 if cooking in a pan, then you can add ¾ to 1 cup water. cover the pan and simmer till the veggies are cooked. 28. now take half a portion of the gravy in a thick bottomed pan or if you want you can layer in the cooker itself. 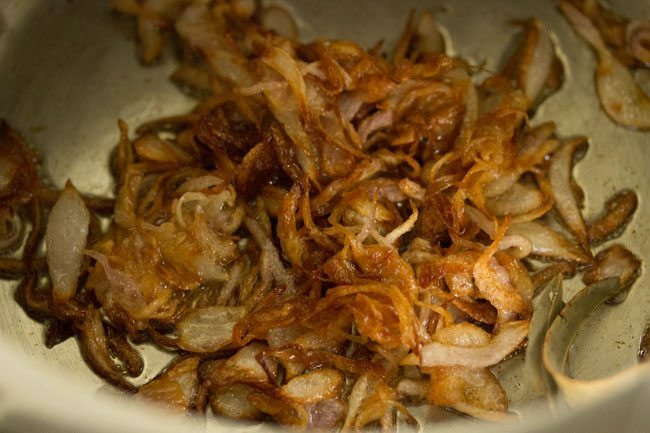 30. top with half of the fried onions all over. 31. then sprinkle with half of the saffron + kewra water + rose water + milk mixture. 32. dot with some ghee. 33. layer with the remaining of the mix veg gravy. then layer with the remaining rice. 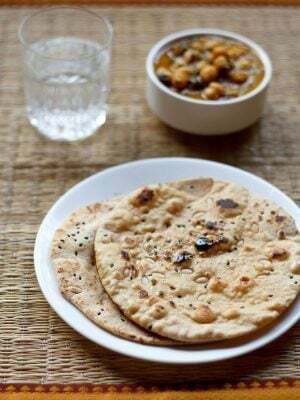 34. repeat layering with fried onions, saffron milk and dotting with ghee. 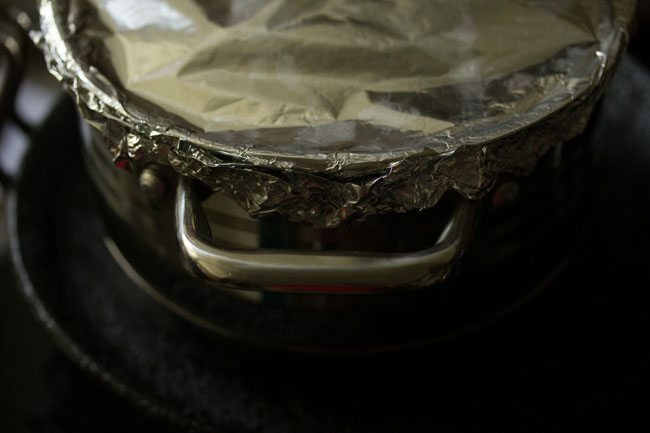 35. tightly seal the pan with an aluminium foil. 36. cover the pan with its lid. 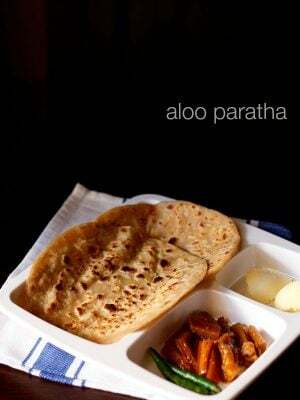 place the pan on a tawa. keep the flame to a low and dum cook biryani for 30 to 35 minutes. if baking kolkata biryani then preheat oven at 180 degrees celsius for 10 minutes. bake for 30-35 minutes at 180 degrees celsius. use an oven proof pan if baking in an oven. 37. once done, switch off the flame. 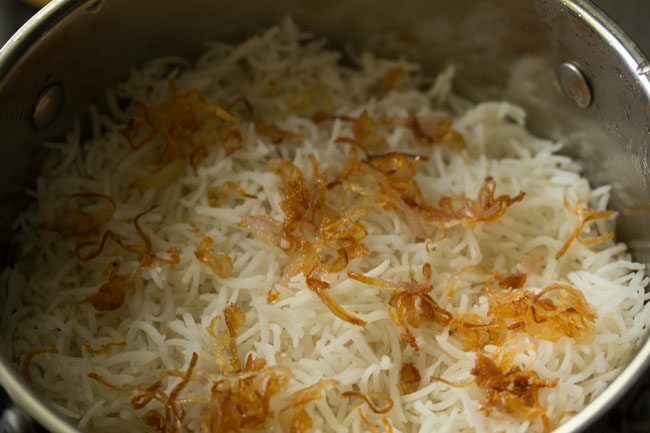 let the kolkata biryani rest for 5 to 7 minutes at room temperature before serving. 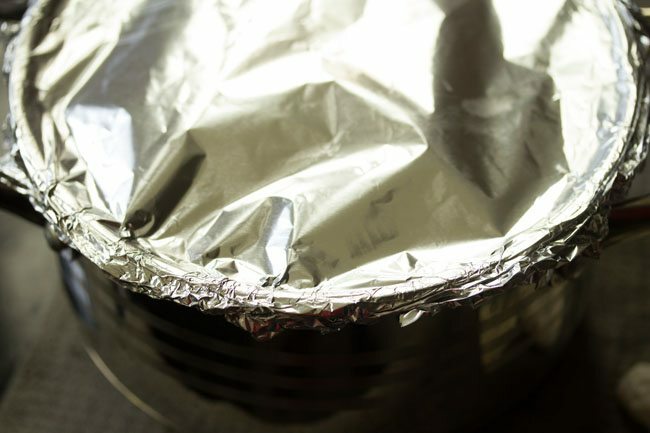 then open the lid and the foil. 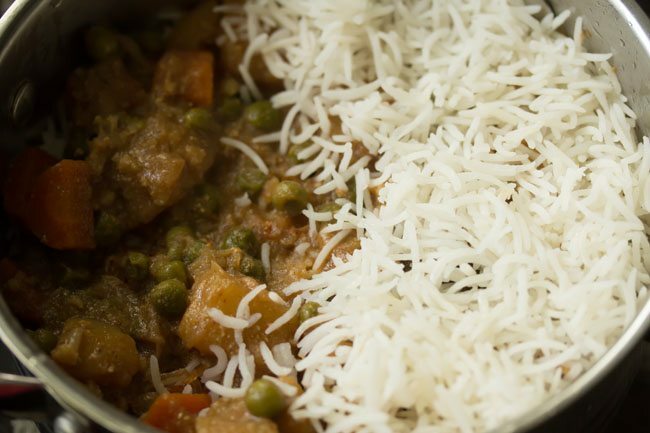 if you see some gravy or a watery consistency at the bottom, then dum cook the biryani for some more minutes. 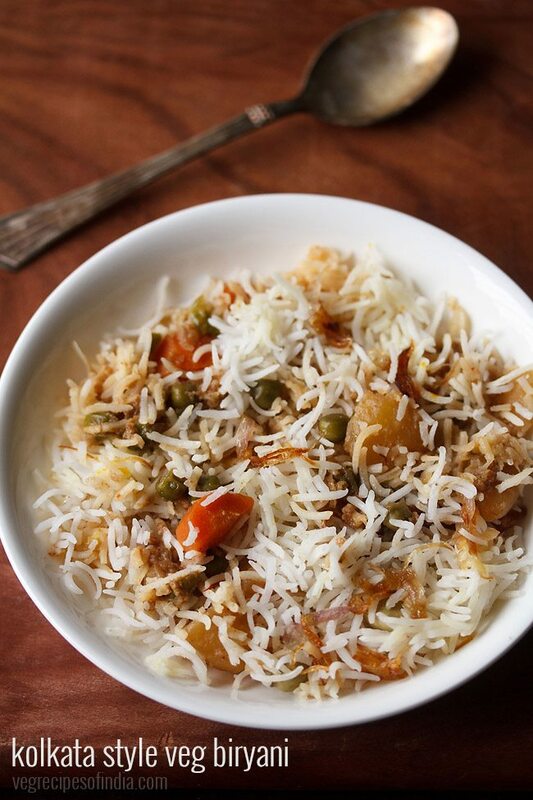 38. serve kolkata style vegetable biryani with raita and pyaz ka lachcha. 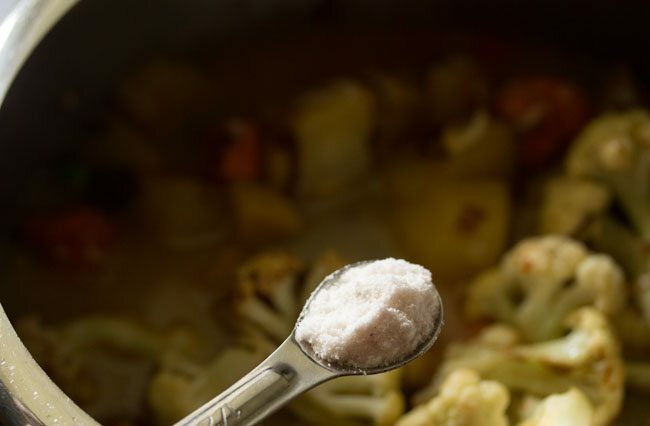 Dassana, you maintain and excellent website with great recipes, but would be so much more useful if readers could copy/paste and save the information on a particular recipe for the time when they will prepare the recipe. Thank you for your excellent work. thanks nandini. i have removed the copy paste option as i have been a victim of plagiarism and content theft many times. usually websites which copy and lift pics, do not have any contact or social media, where you can message them. so one has to just helplessly see all your hard work getting copied. whenever i have removed the copy paste option as a few readers have complained, then at the same there is an increase in the copying that happens. i come to know about this through the wordpress option where the people copying are so lazy even to remove the links. then these links point to my website from theirs. just recently i had removed the copy paste for some days and again i see copying happening. there is this very popular site also which was copying paragraphs & recipes blindly from mine as well as other websites. so to avoid this i have no option but to disable the copy paste option. thanks abhishek. do try and share your feedback of possible.